Cambodia is regionally and internationally important for the conservation of terrestrial and aquatic habitats and threatened species of wildlife. Tiger, Asian elephant, wild cattle, large waterbirds, and other rare species of plants and animals are part of Cambodia's natural heritage. Healthy habitats and populations of wildlife are economically important to Cambodia in many ways. Communities rely on plants and animals from the forest to meet subsistence and cash needs. Forests protect the health of inland waters that are important spawning or feeding areas for the fish that most Cambodians rely on for protein. 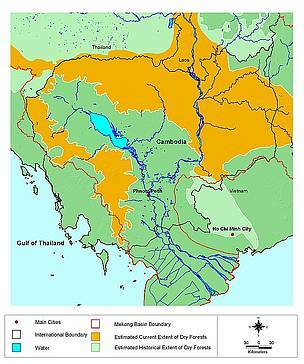 In Cambodia, human population density is low, and there are relatively large natural areas that are still intact. However, some species are being harvested at unsustainable levels and might soon become extinct in Cambodia. At the same time, important natural habitats are being lost at an increasing rate. To meet these threats, the WWF Cambodia Programme is working with the government, other non-government organizations (NGOs), local communities, and the private sector on conservation and sustainable development programmes. The Eastern Plains Landscape (EPL) covers an area over 30,000 square kilometers in 4 provinces (Ratanakiri, Mondulkiri, Kratie and Stung Treng) and forms the largest intact block of forest in southeast Asia. Northeastern Cambodia’s Mondulkiri Province, at the core of the EPL, is recognized as one of the 200 most important areas for global biodiversity by WWF. Mondulkiri's two protected areas, Srepok Wildlife Sanctuary (SWS: 363,177ha) and Phnom Prich Wildlife Sanctuary (PPWS: 222,500ha) contain a large diversity of habitats ranging from hill evergreen to open dry forest, and supports resident populations of many endangered species including Asian elephant, tiger, leopard, banteng, Siamese crocodile, and Eld’s deer as well as several endangered large waterbirds and vultures. To counter serious threats to the landscape and to conserve the EPL’s globally significant biodiversity, WWF-Cambodia has set up the Eastern Plains Landscape Project in cooperation with Ministry of Agriculture, Forestry and Fisheries, Forestry Administration and Ministry of Environment, General Department of Administration for Nature Conservation and Protection. The EPL project works to conserve biodiversity in Mondulkiri province focusing on the two protected areas but is also active through the entire province promoting sustainable resource use, land use planning and reducing wildlife crimes. The project's vision is to keep the last wilderness of Cambodia intact and connected, helping people protect their wildlife while sustaining livelihoods. The EPL’s rich biodiversity is under threat due to uncontrolled logging, hunting for trade, land clearance for agriculture and settlements, and other unsustainable use of natural resources. Economic development including mining and hydropower form additional serious threats to forest and wildlife. Species like the Kouprey, Cambodia’s national animal, have probably already gone extinct, and tiger, Asian elephant, wild water buffalo and Eld’s deer are threatened with extinction in the next few years unless immediate action is taken. Improving community-based natural resource management, education and awareness. Ecotourism development for conservation livelihoods. Research Mondulkiri's rich biodiversity for effective management. Reduce threats to wildlife and forest habitat. 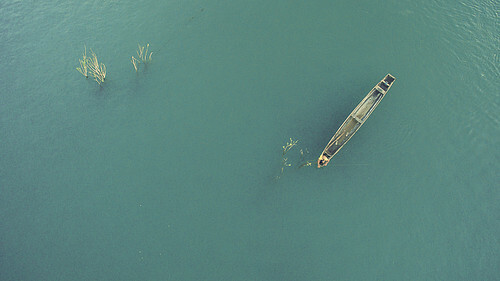 Cambodia is home to iconic freshwater habitats – the Mekong River and its floodplains; the Tonle Sap Lake with its unique seasonal flood pulse. Together with the country’s many other large and small rivers and wetlands, these freshwater resources make Cambodia regionally and internationally important for the conservation of aquatic habitats and the wildlife they contain. Freshwater resources are central to the well-being of Cambodia’s people and wildlife: They provide fish for food, water for transport, irrigation for rice fields, natural flood control, and a home to endangered wildlife such as the Irrawaddy dolphin or the Mekong giant catfish. Unfortunately, these vulnerable wetland resources are under increasing threat from human-induced changes. WWF-Cambodia’s Freshwater Programme works along the Mekong River to conserve key freshwater habitats, aquatic species, and ecological functions identified within the Mekong River Ecoregion in Cambodia. It promotes the creation of Community Fisheries groups and conducts research to collect information on Mekong basin biodiversity and future conservation management. The Freshwater Programme also coordinates and manages WWF-Cambodia’s efforts as a regional partner of the Wetlands Alliance and of the Cambodian Mekong Dolphin Conservation Project. Since the work of WWF in Cambodia is so variable, most of it takes the form of specific projects that focus on a specific area. Examples include action plans that target specific species or regions as well as development plans that address specific sectors or problems. The outputs of our work here at WWF-Cambodia is recorded by regular reports and studies. Making these detailed documents publicly accessible can help to raise awareness of how and why WWF-Cambodia promotes ways to conserve Cambodian biodiversity together with the Cambodian people.